Sweden began their final game at Euro 2012 looking to exit the competition with some pride salvaged and some hope for the future restored. They faced a French side they had not beaten in a competitive game since October 1949 in Stockholm and a team that was looking to finish the group stages at the top of the group and avoid a game against Spain in the quarter finals. Sweden defended well throughout the game and prevented France from having any meaningful shots from inside their area while sublime finishes from Zlatan Ibrahimovic and Sebastian Larsson saw that the Swedish fans would at least have something to cheer about during this tournament as the Swedish took the game and the 3 points 2-0. Sweden once again stuck with Hamren’s prefered 4-4-1-1 formation but he again made changes from the team that played against England. The back four remained the same, while Rasmus Elm was replaced by Bajrami on the left hand side of midfield as Ola Toivonen took the place of Johan Elmander up front with Ibrahimovic playing just behind him. Sweden began the match well, with their first shot coming as early as the 3rd minute when Ola Toivonen found himself open in the box for a free header which he sent just wide. Seb Larsson then found himself open in the box from another cross but his header was straight at the keeper. Sweden were attacking well using the left hand side early on with Martin Olsson and Bajrami linking up well and providing crosses that were finding the heads of team mates more than in previous games. Again Sweden tried to play passes to feet and avoid the long ball when they got possession so that they didn’t hand the ball straight back to the French. This was evident in the number of short passes attempted in the first half, 216 attempts with 188 of these completed, with only 13 attempted long balls in the first half and 9 of them were completed. Toivonen should have opened the scoring for Sweden in the 10th minute after he rounded the keeper but a heavy touch closed the angle and his shot hit the post and bounced away for a goal kick. Throughout the first half Sweden defended well and managed to get tackles and blocks in whenever possible as the French began to shoot from range as they couldn’t break down the Swedish defence that was dogged and determined not to let the French in behind them. Jim Beglin talking about the French being forced to shoot from range. As the half wore on Sweden began to find it easier to get into space to receive balls and to complete passes more easily as the French defenders didn’t close down the spaces or the player on the ball. Despite this, France still had more of the possession throughout the first half with Sweden finishing the half with 47.2% of the ball. Sweden were also forced to defend deep as shown by the territory statistic with Sweden having 38% compared to France’s 62%. Excellent defending from Sweden, Martin Olsson and Olof Mellberg in particular kept the French at bay as the half-finished 0-0. 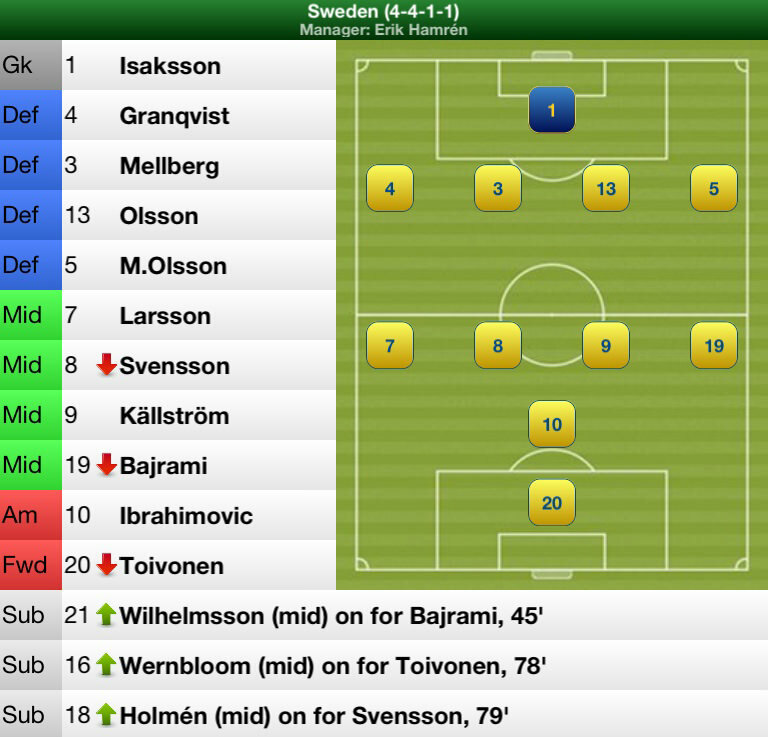 Sweden made 1 change at half time with Wilhelmsson replacing Bajrami and he immediately had an impact upon the game. His first involvement was a run in behind the French defence which was ruled offside, but it was a sign of things to come from Wilhelmsson. Peter Drury commentating on how much Wilhelmsson’s substitution impacted the game. The first goal of the game was scored through a sublime demonstration of skill, technique, ability and body control from Zlatan Ibrahimovic as he latched onto a cross from Larsson and volleyed it into the back of the net, there was nothing the French goalkeeper could do to stop it. In the build up to the goal Christian Wilhelmsson had delivered a superb cross into the box which Larsson had fired at the keeper, France cleared but Sweden quickly regained the ball, some good build up led to an excellent cross from Larsson who managed to find Ibrahimovic lurking on the edge of the box ready to pounce on what turned out to be his only shot of the match. Jim Beglin describing Ibrahimovic’s goal. Sweden had begun the second half looking the better team as Wilhelmsson and Ibrahimovic were linking up well, with Ibrahimovic finding Wilhelmsson 6 times out of 8 attempted passes in the 45 minutes Wilhelmsson was on the pitch and Wilhelmsson finding Ibrahimovic on 3 occassions. 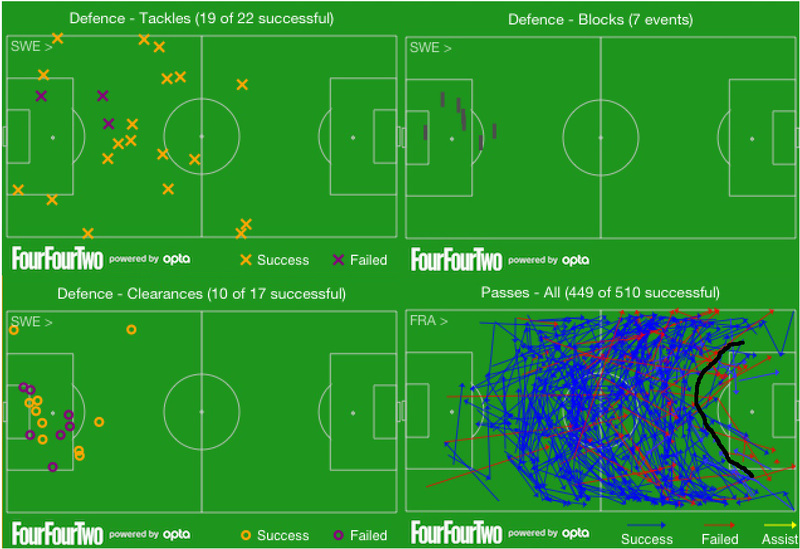 Sweden’s defence continued to prove an effective obstacle preventing France from having any meaningful chances and forcing them to shoot from range, with both of Sweden’s centre backs performing their jobs exceptionally well. The Swedish defence also seemed to have worked on defending crosses into the box following the deficiencies they showed prior to the tournament and in the first 2 games of the tournament. The good defensive work by the Swedish team is displayed in the graphic below demonstrating their tackling (top left), the blocked shots during the game (top right) defensive clearances (bottom left) and the effective ‘wall’ they built as a defensive unit in preventing France from making many passes in and around their penalty area (bottom right), as highlighted by the black line. Clearly Sweden’s tackling was excellent and defenders threw their bodies in the way of shots in and around the area, while they successfully cleared the ball 10 times out of 17, many of these being critical clearances inside the penalty area. Sweden eventually added a second goal to secure the 3 points in the 91st minute when Sebastian Larsson powered the ball into the roof of the net following Holmen’s effort which hit the crossbar. 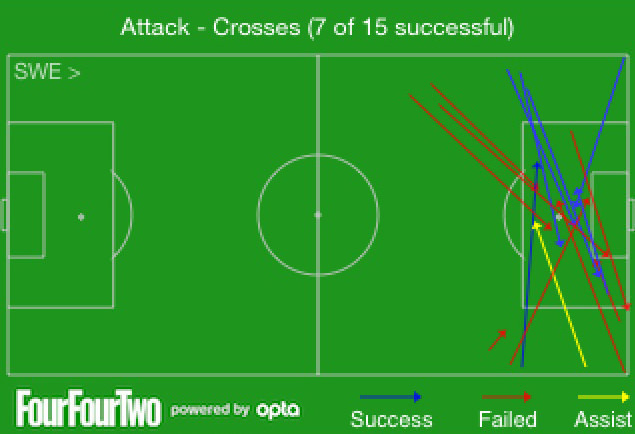 Sweden’s crossing quality was also greatly improved in this game (as shown below) as they completed 7 of 15 attempted crosses, with one of them being the assist for Ibrahimovic’s goal and another by Wilhelmsson being key in setting up Larsson’s goal. They completed 3 out of 7 attempted crosses from the right hand side one of which was an assist and the other was the cross that was key in the build up to Larsson’s goal while down the left hand side they completed 4 crosses from 8 attempts. Christian Wilhelmsson could have added a third goal right before the final whistle but indecision cost him dearly as he tried to round the keeper but failed. The second half-finished and Sweden had secured not only their first victory of Euro 2012, but also their first victory over France in a competitive game since October 1949. They finished the game with 43.5% possession, and just 39.9% territory as they were subjected to a final 15 minute onslaught from the French as they attempted to level the game. France finished the game with 14 shots outside the box of which only 2 were on target, which simply demonstrates their inability to break down the Swedish defence and although they had 10 shots at goal from inside the box only 2 of these shots where on target as Sweden blocked 3. France created 22 chances to score, while Sweden created only 10 chances but Sweden had the quality and the desire to finish their chances while the French looked lacklustre at times. Sweden’s shots at goal map (below) demonstrates this as they may have had less shots, but they had more on target than France, who only managed 4 on target compared to Sweden’s 6. Choosing one key player from this match was difficult due to some excellent defensive work by all members of the team, especially the two centre backs, the excellent work of Christian Wilhelmsson following his introduction at half time which changed the game and gave Sweden an added threat going forward, or the two goal scorers who were vital to the way the team played. Sweden finally showed what they are capable of in this game against France, they played with attacking flair and defensive grit putting in a greatly spirited performance despite already being out of the tournament. They gave their fans something to cheer about and managed to get some younger players some experience. It may also be the last time Olof Mellberg pulls on the jersey for the Swedish national team after 117 matches and being a regular fixture in every major international tournament since Euro 2000, he gave a performance which epitomised his career. The team as a whole improved game upon game as their tactics developed and they attempted to play more football than in the first game giving more passes to feet and using the width of the pitch more. Their defending in this match was a lot better as they were able to deal with balls being crossed into the box more effectively, using their height advantage over France, their defending was by no means perfect and there is still some work to be done on picking up attackers from corners but it was a spirited performance which showed a lot of character and heart. They continued to show what a threat they could be going forward also with Ibrahimovic leading the goalscorers for Sweden and possibly scoring the goal of the tournament so far. Perhaps Christian Wilhelmsson should have started more games, but things always look different with hindsight, as he was key to the improved perfomance in the second half of this game. There were again 3 Premier League players on show for Sweden in the match against France. Sebastian Larsson of Sunderland finished the game with a goal to his name from 4 shots at goal, 3 of which were on target. He completed 89% of his passes, 80% of his passes were completed in the final third. Larsson created 1 chance which led to his 1 assist, while he completed only 1 of his 6 crosses, but the one completion led to the goal. He made 100% of his tackles and made 2 interceptions, showing his ability to track back and help out his defence. Martin Olsson of recently relegated Blackburn had a good game at left back, completing 89% of his passes, while he also created 1 chance. He only attempted 1 cross which was completed and finished the game with 100% tackling, with 1 block and 2 completed clearances from 3 attempts. Martin Olsson also won his only aerial duel and committed no fouls, demonstrating his discipline at the back. Finally Jonas Olsson of West Brom played the game at centre back and was one of the key performers who was instrumental in keeping the French strikers out of the Swedish box. He only completed 83% of his passes, but critically he made 2 blocks and cleared the ball successfully 4 times out of 6. He was also dominant in the air clearing the ball with his head 3 times from 3 attempts whilst also winning his only aerial duel. He did not complete a tackle, but only attempted 1 and he finished the game only conceding one foul. Most importantly he was a member of the back four that kept a clean sheet. Sports science graduate, intent on becoming a performance analyst. Looking for experience and positive feedback that can be used in the future to enable me to provide insights in sport. 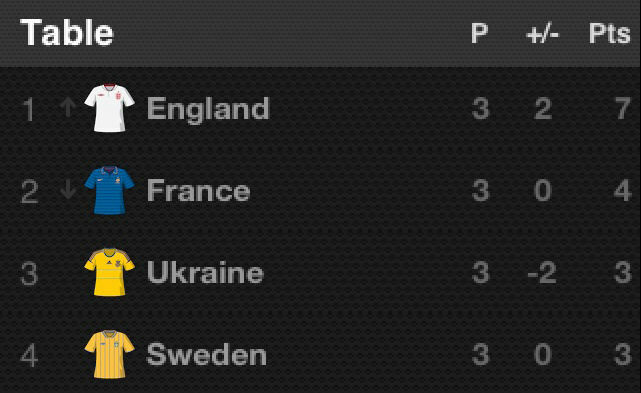 Categories: England, EPL Index Featured Article, EPL Index Statistical Comparisons, Euro 2012, France, Sweden, and Ukraine.' 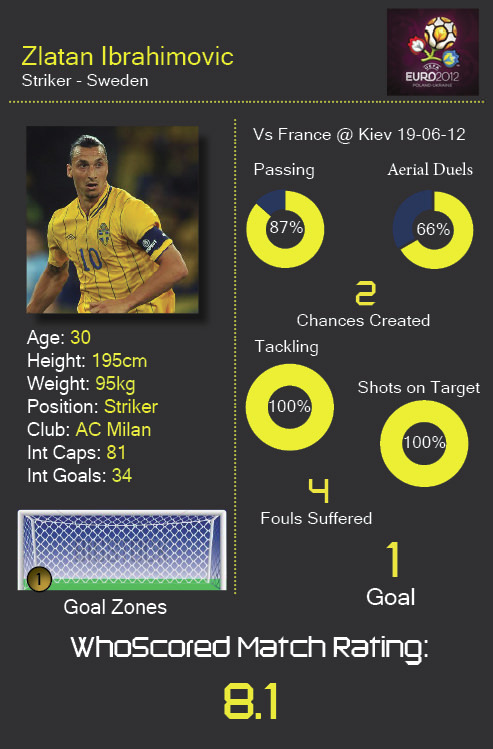 'Tags: analysis, Ball, Elm, England, Euro, Euro 2012, Euro 2012 Opta Stats, Euro 2012 Stats, Euro 2012 Sweden, Euro 2012 Sweden Stats, football, France, Group D, Ibrahimovic, Isaksson, Kallstrom, Larsson, LFC, Milan, Performance, Poland, soccer, statistics, Sunderland (NN), Sweden, Uefa, Ukraine, and Wilhelmsson.